Rain Dance Video Slot Guide & Review - Casino Answers! Rain Dance is a 5-reel, 20-line video slot from Realtime Gaming, featuring scatter wins, wild substitutes, multipliers, a re-spin feature, a free spins feature and a progressive jackpot. You can play the Rain Dance Real-Series video slot at US-friendly online casinos Slotastic Casino and Cherry Red Casino. 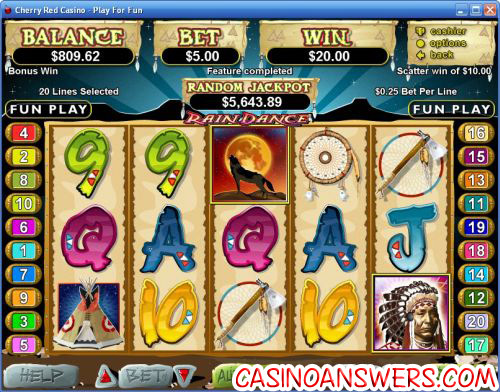 Rain Dance is a Native American themed video slot, using many common Native American icons as its game symbols. Some of these symbols consist of the Bald Eagle, Tipi, Drums and an Axe. There are also Ace, King, Queen, Jack, Ten and Nine symbols styled in a Native American type font. The Native American symbol art is excellent and really adds to the feel of the video slot. To play the Rain Dance slot machine, set your bet per line. Wagering options are $0.01, $0.02, $0.03, $0.04, $0.05, $0.06, $0.07, $0.08, $0.09, $0.10, $0.25, $0.50, $1, $2.50 and $5. You can also set your number of active paylines (up to 20). The minimum bet on the Rain Dance video slot is $0.01 ($0.01 on a single payline) and the maximum bet is $100 ($5 on all 20 paylines). Rain Dance is designed for both casual players and high rollers to play. Once your bet is ready, use the “Spin” button the spin the reels on Rain Dance. Rain Dance has a progressive jackpot that is triggered at random. At the time of this writing, the Rain Dance Random Jackpot is at almost $12,000. If you are looking to increase your chances of triggering the progressive jackpot, try increasing your bet per line. Progressive jackpot wins are added to payline and scatter wins. Random Jackpot contribution is no more than 1.5% of total Return to Player. The top fixed jackpot on the Rain Dance video slot is the Tipi symbol. On its own, it is worth 2500 coins, but when coupled with one or more Chief wild symbols, it will be doubled to 5000 coins. The Chief symbol is Rain Dance’s wild symbol. It only appears on the first and fifth reels and substitutes for all other symbols in the game including scattered Coyotes. The Chief symbol doubles the prize when it appears in a winning combination. A re-spin feature is triggered when two or more scatter symbols appear anywhere on the reels of Rain Dance. After winnings are paid out, the reels with the scatter symbol are held while the remaining reels are re-spun. Scatter pays are awarded again after the re-spin. If 5 scatters appear on the re-spin, all reels re-spin to the triggering position. If 3, 4, or 5 scatter symbols appear after a re-spin, you will trigger 10, 15 or 100 free spins, respectively. You will also receive a multiplier of 3X, 4X or 5X depending on how many scatters you receive. The re-spin feature can be triggered during free spins. 3 or more scatter symbols occurring after a re-spin will award the same number of additional games as the original trigger. Free spins are played at the lines and bet of the triggering bet. During a spin, you can always use the “Stop” button to stop the reels at will. The “Stop” button replaces the “Spin” button while the reels are spinning. Any winning combinations you receive will be paid out. You can access the skill stop during autoplay mode. The Rain Dance video slot has an autoplay mode that is found with the rest of the game buttons. You can set the number of spins (up to 1000), stop when the jackpot is won, stop if a win exceeds or equals (up to $99,999), stop on any win, stop if your balance increases by (up to $99,999), stop if your balance decreases by (up to $99,999) and stop once the feature is triggered. Autoplay can be stopped at any time by using the “Stop Auto” button. Skill stop is available during free spins. Autoplay is a great way to play a lot of spins without doing a lot of clicking at Slotastic Casino. Rain Dance is a great effort by RTG. Not a lot of slot machines will allow you to win up to 100 free spins without having to trigger more free spins. Add that to the fact that the wild symbol will not only substitute for the scatter symbol (which comes in handy when trying to trigger the free spins feature), but also doubles your scatter wins, we really dug a lot of the simple inclusions Rain Dance has to offer that you don’t see very often in other video slots. For a wide variety of promotions including a $300 signup bonus to play the Rain Dance video slot (and much more), please visit Slotastic Casino! Can players located in the United States play the Raindance video slot for real money? How do I win the Raindance progressive jackpot? The Raindance progressive jackpot is triggered at random and can be won any spin. Make sure you increase your bet per line to also increase your chances of triggering the progressive jackpot. 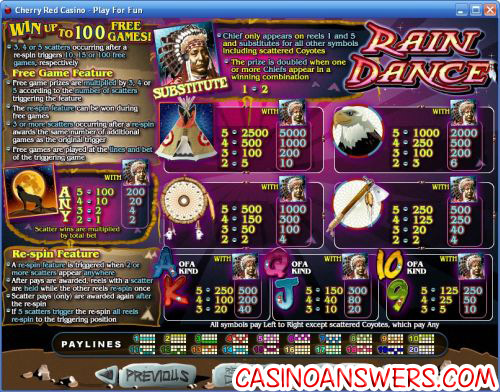 Do I need to download any software to play the Raindance video slot game? You can play Raindance using Slotastic Casino‘s Flash casino for instant play. This is especially great for Macintosh users. If you experience any issues playing the Raindance Flash game, try downloading the latest version of Adobe Flash Player for best results. What special features can I find on the Raindance slot machine? Raindance offers a free spins feature with up to 100 free spins and a 5X multiplier, a re-spin “hold” feature, a wild symbol that substitutes for scatter symbols, a randomly triggered progressive jackpot and more. What slot machines are available at Slotastic? What is a good RTG video slot?